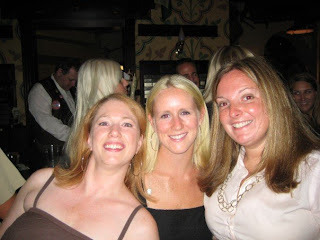 One of my favorite trips was to Las Vegas with my Trinity girlfriends Kathleen and Maura. I found it funny that despite the city boasting some of the best restaurants and nightclubs, we found ourselves at an Irish bar. Some things never change. Some would argue a good portion of our college life was spent at the Irish Times on Capitol Hill. Anyway, while we were in Vegas we were fascinated by the strange people we met. We thought it would be a genius idea to start a fashion line called LIES. The line would be filled with cocktails dresses with side pockets so one could easily hide their wedding ring. Seriously, wouldn’t that be ideal? Here is a pic from our trip. Did anyone catch Ashton Kutcher on Good Morning America today? When asked about working on a movie with Julia Roberts he responded that it was exciting given he has been watching her since he was a CHILD. Really? Is this the same guy married to Demi Moore? Ashton Kutcher is not that much younger than Julia Roberts. Low blow, buddy. He should be thrilled he is even appearing in the same movie with Julia Roberts. Something tells me it will not be a happy night at casa del Kutcher.